"Addressing the fundamentals of ophthalmic photography in a way that is easily understood by even a novice photographer, and providing the experienced photographer with cutting-edge technology references, this text is a well-written guide that is invaluable." "Ophthalmic Photography is a major achievement." "The second edition effectively addresses new developments in electronic imaging while remaining relevant to those engaged in traditional photography. The authors have scored on all points in their effort to produce a complete reference for ophthalmic photographers and angiographers." "Readers will undoubtedly benefit from the information resources and descriptive skills of the authors and their ability to convey complex technical tasks in an easily assimilated form. In summary, this reference textbook should certainly be a staple text for both students and advanced professionals." "This book can definitely be recommended for its in-depth information and its readable style with profuse, relevant, high quality illustrations. " "...this text will be the standard textbook for ophthalmic photography by which all others are measured for years to come." "...a significant revision of ... Saine & Tyler's outstanding textbook...."
"Clear, consise, very well written and illustrated work contains enough basic information for teaching novices to perform fundus photography and enough coverage of advanced techniques to keep experienced ophthalmic photographers up-to-date." "Saine (1) y Tyler (2), fotógrafos oftalmológicos con amplia experiencia y reconocido prestigio, presentaron la primera edición de este texto en 1997. Los grandes cambios surgidos desde entonces en el mundo de las técnicas de imagen de fondo de ojo han justificado esta temprana segunda edición, revisada y ampliada. "En definitiva, este libro es una referencia esencial en el campo de las técnicas de imagen de fondo de ojo: claramente expuesto, con una amplia información y bibliografía, y una excelente iconografía. Dirigido especialmente a fotógrafos oftalmológicos, es igualmente recomendable para ayudantes de oftalmología, residentes de la especialidad y oftalmólogos interesados en el campo de las técnicas de imagen de fondo de ojo." 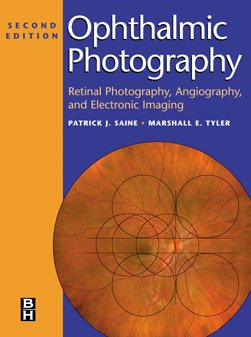 "Saine and Tyler have assembled a book that may be the most comprehensive textbook on ophthalmic photography; it is certainly the most up to date regarding electronic imaging of the fundus. It is creatively illustrated and contains several hundred images, both color and black and white." "This reference book is an excellent handbook for the beginning photographer and a useful tool for the advanced photographer and photography instructor." "This textbook is an outstanding resource for everyone interested in ophthalmic photography." "Each chapter, while an integral part of the whole, is a thoughtfully crafted, stand-alone tratise on the subsection adressed." "I can recommend this book without reservation to anyone interested in ophthalmic photography/imaging." "'The authors thoroughly explore fundus photography, stereo fundus imaging, fluorescein angiography, and indocyanine green angiography in terms of both instrumentation and technique." "Ophthalmic Photography: A Textbook of Retinal Photography, Angiography, and Electronic Imaging should be in the hand of every student and on the shelf of every ophthalmic practice." "This is the most detailed and well illustrated textbook on the technique and practice of retinal imaging to be published to date." "The text on FFA has been an invaluable training aid coupled with practical sessions." "This textbook is an essential, substantial reference work which should remain relevant for several years in this era of technological change." "This book can be definitely recommended for its in-depth information and its readable style with profuse, relevant, high quality illustrations." "... all ophthalmic instrument firms and all hospital eye departments will "
"Excellent historical,technical and clinical aspects of electronic imaging of the fundus are provided ..."